Blue Cart Residential Recycling zones and schedule. Each recycling zone is divided into two sections – A (Orange) and B (Yellow). Collection is done on an alternating-week basis. For 2012, B/Yellow sections were collected the week of 1/2/2012 and A/Orange sections were collected the week of 1/9/2012, continuing to alternate from there. See http://bit.ly/wssHIB or https://data.cityofchicago.org/d/eb3b-ehmq for the full schedule. For more about Recycling in Chicago, visit http://bit.ly/IcfLHr. To view or use these files, special GIS software, such as Google Earth is required. Blue Cart Residential Recycling zones and schedule. Each recycling zone is divided into two sections – A (Orange) and B (Yellow). Collection is done on an alternating-week basis. For 2012, B/Yellow sections were collected the week of 1/2/2012 and A/Orange sections were collected the week of 1/9/2012, continuing to alternate from there. See http://bit.ly/wssHIB or https://data.cityofchicago.org/d/eb3b-ehmq for the full schedule. 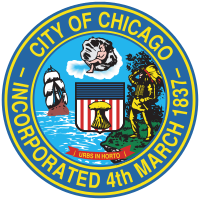 For more about Recycling in Chicago, visit http://bit.ly/IcfLHr. To view or use these files, compression software and special GIS software, such as ESRI ArcGIS, is required. Locations in Chicago where residents can drop off recycling. For more about Recycling in Chicago, visit http://bit.ly/IcfLHr. To view or use these files outside of a web browser, compression software and special GIS software, such as ESRI ArcGIS, is required.